Catching 100lb-plus Marlin is what you can expect from your Cabo San Lucas fishing vacation. 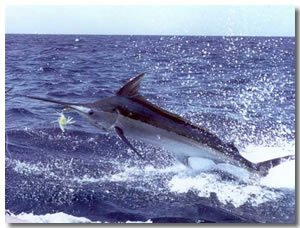 The Sea Of Cortez is a trap for Marlin, and over 600 other species of fish. The nutrient rich sea is a feeding ground making Cabo San Lucas the Marlin capital of the world. You can keep the fish that you catch although Cabo San Lucas does have a catch-and-release policy. This is encouraged by the local fisherman but it's not the law. This activity is encouraged so Cabo San Lucas stays the Marlin Capital of The World. The keeps the marine ecosystem in a more natural state. Sorting out your Cabo San Lucas fishing charter before you set off for your Cabo fishing vacation will save you the organizing when you get there. If you don't charter your boat first get some local info first on the best companies to go with. Find out who knows the best fishing waters, and has the catch rate you are after.